The traditional April new year dawned on a sad note for me last year.I woke up to the news that well –known singer of film songs Prathivadi Bayankara Sreenivas (P.B.S) had passed away in India. He was one of my favourite filmsong singers.I grew up with the Tamil film songs of people like Sreenivas, TM Soundararaja, P.Susheela, S.Janaki, AL Raghavan, LR Eeswari etc. Although the octogenarian had been inactive as a play back singer for over two decades the voice of PBS (Sreenivas often quipped that his initials PBS denoted Play Back Singer) like those of his contemporaries, never ever went out of my life thanks to audio and video cassettes. I also got opportunities to hear him singing in person when he visited Canada for musical shows. Seeing these veterans live on stage was both a joyful and sorrowful experience. It was great to see them perform in the flesh but I was equally moved to see those golden voices now faltering and cracking due to age struggling to render the songs which they once sang with gusto and verve.I would return home and play those songs again. While listening, I would nostalgically hark back to their glorious past and contrast it with the flickering present. The passing away of PB Sreenivas on April 14th last year spoiled April new year for me last year. The loss of PBS was followed by the deaths of TK Ramamoorthy three days later.TKR was the partner of MS Viswanathan for over a decade as music composer. The Viswanathan-Ramamoorthy Duo known as the “Mellisai Mannargal” (Kings of Light Music)were the uncrowned kings of Tamil film music in the sixties of the last century. One month later another film music great TM Soundararajan also breathed his last.A few months later the well-known Tamil film lyricist “Vaali” also passed away. The departures of these great personalities evokes a sense of loss in people of my generation who were their fans and rasikas from childhood. It was my ardent desire to write about these singers,musicians and poets and of their renditions, compositions and creations.Family members and friends urged me to do so.I too wanted to write but just could not find the time or energy. Writing about these people can only be a labour of love and nothing else. I thought that I must write about them at least when the anniversaries of their demise are observed this year.Hence I begin this “Jaya”new year with a tribute to PB Sreenivas who died on the same new year day last year. Instead of trying to write a comprehensive essay about him at one go , I thought of focussing on certain facets of the man and his songs in a series of occasional articles about him. PB Sreenivas was a Telugu by ethnicity. However he sang over 3000 songs in several Indian languages inclusive of Tamil in a career that spanned many decades. It was in Kannada films that Sreenivas had the greatest impact. He used to voice for the great Kannadiga actor Rajkumar who himself remarked that he(Rajkumar)was the “sareeram” (body)and Sreenivas the “Saareeram” (Voice). PBS who lived in Chennai sang many songs in Tamil films.As in the case of Rajkumar in Kannada films, PBS achieved much recognition as the singing voice of “Kaadhal Mannan” (Romance king) Gemini Ganesan. He also sang for actors like Balaji, Aananthan, Sreeram, Ravichandran, Jaishankar, Muthuraman, Kalyanakumar etc. He sang very few songs on screen for MG Ramachandram, Sivaji Ganesan or SS Rajendran. PB Sreenivas has often been described as a “crooner” of film songs.Usually Crooners sing slowly and softly in a captivating manner. The songs are usually of a romantic flavour. This sentimental singing style tugs the emotional heartstrings of the listeners.PBS excelled in crooning during his halcyon days. The love songs were both sad and happy. He was also praised for rendering philosophical and inspirational songs on screen.The Viswanathan-Ramamoorthy duo provided a lot of opportunities for PBS.After they broke up MS Viswanathan gave PBS a lot of chances. PBS sang many solos and duets for Tamil films. He was paired with singers like Jikki, P.Susheela, S.Janaki, Jamuna Rani, Soolamangalam Rajalakshmi and LR Eeaswari in singing Tamil film songs.Though PBS songs with Susheela are greater in quantity, it is his duets with Janaki that are great in quality. This is my personal opinion which I know is shared by many.Who can forget the immortal” Thennankeetru Oonjalilaey? S.Janaki’s first song in a Tamil films was with PB Sreenivas. As stated earlier both these Brahmin singers hailing from Telugu land have made their marks in Tamil cinema by rendering memorable duets. Though PBS sang softly and pitched it low and medium , his voice was a deep bass. Janaki singing high pitch was a soprano who was capable of getting away with falsettos. Both were singers without formal training in carnatic music. Sreenivas and Janaki complemented each other in singing.More importantly there was a personal chemistry between them. Both respected each other and got on famously. PB Sreenivas who wrote poems in many languages penned several in praise of Janaki. She framed some and hung them on her wall. Once while celebrating her birthday PBS delivered an impromptu speech and spontaneously shouted out “Janakikku Jay” in different languages. “We have lost the most humble singer I have ever come across in my life. He was so humble that he spent most of his time appreciating the work of fellow singers. He would even take time to write poems praising their work,” Janaki, who sang several chartbusters with him over the years, told IANS. “He was known for his simplicity and very welcoming attitude. Even when he was at the pinnacle of his career, he never grew greedy of his position and always respected fellow artists,” she added. “My first song in Tamil ‘Magadhal naattu Mary’ was with PBSji. We sang so many duets together. I can’t exactly remember how many songs, but most of them were quite popular,” she said. It is against this backdrop that I would like to write about some of the PB Sreenivas-S. Janaki duets in this piece.They could be compared to the Ghantasala – Leela and TM Soundararajan-P Susheela duos. Janaki herself has sung with many others including TM Soundarajan, KJ Jesudas, SP Balasubramaniam and “Malaysia” Vasudevan. Sreenivas too has paired with others notably P.Susheela with whom he has sung some unforgettable numbers. However I want to focus briefly on some PBS-Janaki songs in this piece. S.Janaki’s first break in Tamil films was when she got an offer from music director Salapathy Rao for the film “Vithiyin Vilaiyaattu”. However that film never saw the light of day. Hence her first song in a Tamil film was from “Mahathala Naattu Mary” (Mary from Magdalene).The film released on December 20th 1957 was produced by M.L.Pathi and directed by S. S. Rajan. The song which she sung together with PB Sreenivas in the film was was “Kannukku Nerae, Minnidum Thaarai”. The music composer was Rengasamy Parthasarathy who later migrated to the USA and ran a successful business in music records and cassettes. Since the film itself had a Christian ethos the song too had western music connotations. It is easy on the ear. The words were written by MP Sivan. I think it was picturised on Sreeram and Kumari Thangam. This was the first of the PBS –Janaki Tamil duets on screen. Then came the film “Deivabalam” (Divine strength)in 1959 made in Tamil and Telugu simultaneously. PB Sreenivas and Janaki sang a soulful duet- “Malaroadu Villaiyaadum Thendralae Vaaraai”- with several nuances in that film.The music composer was G.Aswathama who was none other than the father of renowned Veena artiste Echampati Gayathri generally referred to as “Veena Gayathri”. Incidently Gayathri was born two months later in December 1959 after the film was released in July. The song” Maaroadu”by the PBS-Janaki duo was picturised on Balaji and Jayashri in the Tamil version and on NT Rama Rao and Jayashri in the Telugu version. The following year 1960 saw the film “Paathai Theriyuthu Paar” (Look the path is visible) being released. The music was composed by the creative genius M.B.Sreenivasan whose abilities and potential was never utilised or realised fully in Tamil film songs. Among the many immortal songs in the film was “Thennankeetru Oonjalilaey”. This is a song that I like very much. It was the favourite Tamil film song of my classmate and friend Shanthi who is no more. I always think of her when I listen to this song. The film was path breaking in its own way.The director-cinematographer was the Bengali , Nemai Ghosh . This love song was picturised on K.Vijayan and L.Vijayalakshmi.Vijayan later developed into a film editor and director. Vijayalakshmi became popular acting as heroine in the “James Bond type”films made by Modern Theatres in Salem,Tamil Nadu. The song is exquisitely filmed amidst rural scenic beauty. The simple poetic words were written by the great Tamil novelist and short story writer Jayakanthan. Incidently Jayakanthan himself went on to make films based on his writings .MB Sreenivasan utilises instruments such as the flute, violin and piano for the song. They blend harmoniously jointly as well as separately in the song. The flute is played by maestro “Maali” (TR Mahalingam).The sound of the flute invokes the call of the cuckoo and chirping of sparrows.One feels and sways to the Thendral or southern breeze when listening to the song.As the song and music progress to a slow beat and tempo, time stands still and then moves on.This perennial favourite was one which made PB Sreenivas immensely popular among listeners. Another PBS-Janaki duet was in “Pasam”starring MG Ramachandran and Sarojadevi.The duet “Maalaiyum Iravum Santhikkum “was however picturised on Kalyanakumar and Sheela. The music was by Viswanathan-Ramamoorthy.TR Ramanna was the director. The Tamil film song realm continued to be dominated by the TM Soundararajan – P.Susheela duo. Even if music directors were willing to give chances to others, the big star actors and actresses wanted to lip synch only for TMS and Susheela on the silver screen. This tendency prevented PB Sreenivas and Janaki from getting the opportunities they deserved. At least Sreenivas got many chances due to his voicing for Gemini Ganesan but Janaki suffered because star actresses like Padmini, Savithri, Saroja Devi, Vijaya Kumari and Devika insisted upon Susheela and no body else to sing for them. Actually Janaki came into her own professionally only after the advent of Illayarajah in 1976. It was at this juncture that the Sreenivas-Janaki duo got an unexpected boost from ace filmmaker CV Sridhar who ushered in a refreshing change to the world of Tamil cinema. The legendary director was miffed with Susheela for drastically increasing her fee for singing on account of her rising popularity.In a bid to counter the TMS- Susheela monopoly Sridhar thought of promoting an alternative. Sridhar chose Janaki whose classic number “Singara Velanae Deva” in “Konjum Salangai” had captured the hearts of many. Likewise PB Sreenivas too had grabbed attention by his “Kaalangalil Aval Vasantham” in “Paava Mannippu”. Both songs had become widely popular even before the films were released thanks to the airwaves of “Radio Ceylon”. PBS and Janaki had also swung and swayed their way together into many a heart including that of Sridhar through “Thennankeetru Oonjalilaey”. So CV Sridhar signed up the PB Sreenivas – S. Janaki duo for some of his films.Two films directed by Sridhar “Policekaaran Magal” and ”Sumai Thaangi” were released within months of each other in 1962.Policekaaran Magal had three duets for PBS and Janaki besides solos for both.The words were written by Kannadasan while music was composed by Viswanathan-Ramamoorthy. Janaki voiced for Vijayakumari acting as the Daughter of the “Policeman” SV Sahasranamam. One duet between PBS and Janaki was “Intha Mandrathil Oadi varum Ilanthendralaik Kaetkindren”. It was picturised on The brother and sister played by Muthuraman and Vijayakumari. “Sumai Thangi” starring Gemini Ganesan,Devika and L. Vijayalalkshmi had two duets. One was picturised on Gemini and Devika -“Enthan Paarvayin Kaelvikku Pathilenach Cholvathu”.The song begins with Sreenivas melodiously chanting “Radha, Radhaa”. The other “Oh Oh Oh Maambalathu Vandu” is a song picturised on L Vijayalakshmi playing Gemini’s sister and her lover. Sridhar’s supplanting of Susheela by Janaki experiment did not last long.The pressure of top actresses and distributors financing the film production could not be resisted. So Susheela came back into Sridhar films again. “Nenjam Marappathillai” saw PBS and Susheela singing together the unforgettable “Nenjam Marappathillai –Athu Ninaivai Ilappathillai” for Kalyanakumar and Devika. There was however another duet for PBS and Janaki “Azhagukkum Malarukkum Jaathilyillai” in the same film. However in “Kaathalikka Neramillai” which followed after “Nenjam Marappathillai Sridhar seemed to have forgotten the PBS –Janaki and also had no time for Janaki.Susheela sang the duets with both PBS and Jesudas. Thereafter the twin tones of PB Sreenivas and Janaki became increasingly inaudible on the Tamil screen. There were however a few rare duets by both in films. One was “En aaruyire Nal Vaanamuthey” picturised on Geetanjali and another male actor in the film “Theivathin Theivam”.This film was the last film for which music was totally composed by the late G.Ramanathan. Another lovely song was sung by both in the film ”Naanum Manithan Thaan”.The film was produced by the actor CL Ananthan for whom PBS had sung several songs including “Roja Malarae Rajakumari in “Veera Thirumagan”. The PBS-Janaki song ”Kaatru Varum Kaalamithu, Nathiootru Varum Naeramithu” was picturised on Anandan and Chandrakantha. The words were written by Thiruchi Thiyagarajan while GK Venkatesh composed music. Another duet with a classical background was sung by PBS and Janaki in “Thiruvillaiaadal”. The song “Pothigai Malai Uchhiyile Purappadum Thendral” was picturised on Muthuraman playing the Pandyan King and Devika his queen. The words were by Kannadasan and music by KV Mahadevan. It is after this love song where Muthuraman is overwhelmed by the fragrance of Devika’s hair that the Pandyan king is assailed by doubts as to whether the hair of women is naturally fragrant or not. He organizes a poetry competition to clear his doubts. This in turn results in some unforgettable scenes in the film featuring Nagesh, Sivaji Ganesan and AP Nagarajan. For many years after “Thiruvilaiaadal” in 1965 the PB Sreenivas –Janaki duo was not heard of in Tamil films though both did sing separately with others. Finally after eight years the duo sang together again in 1973 for BR. Bhanthulu’s “Ganga Gowri” featuring Gemini Ganesan, Jayalalithaa and Jayanthi. The song was “Antharangam Naan Arivaen” based on the Hindustani Bhageshri raga. MS Viswanathan who composed the music using a wide range of instruments had both PBS and Janaki render the song with soulful passion.Janaki was given the high pitch notes and PBS the medium range notes in order to make both give off their best.It is a song that echoes with music that reverberates. This was the last Tamil film song duet by PB Sreenivas and Janaki. It was most fitting perhaps that the Swansong duet by this mellifluous duo should have been composed by MS Viswanathan who together with TK Ramamoorthy made the PBS-Janaki a household word in Tamil homes listening to “Radio Ceylon” more than fifty years ago. The PBS –Janaki duo gave us some memorable songs. 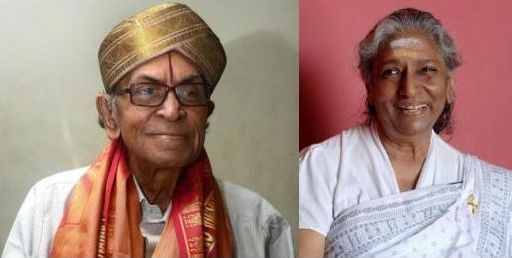 The bass Sreenivas and Soprano Janaki rendered wonderful songs for the Tamil silver screen.It is a great pity that more songs could not be sung together by both in Tamil films though there are many in Telugu films. However their songs though few in number brought immense pleasure to me and those of my generation. The PB Sreenivas –Janaki duets remain unforgettable.